The desire to remain wrinkle free is as old as time itself. History tells us that European women drank large potions of poisonous arsenic, covered their faces in bat’s blood and even used warm male urine in an attempt to exfoliate their skin and preserve their unwrinkled face. And with the pressures of the media promoting unachievable beauty goals and photo shopped women it’s easy to worry about wrinkles; deemed the first sign of aging and loss of beauty! Wrinkles occur naturally and develop with age. Each and every wrinkle on your face has a story to tell or a habit to reveal and is a natural process that we will all experience – although some of us may experience them a little deeper than others. But, it’s all a matter of perspective. 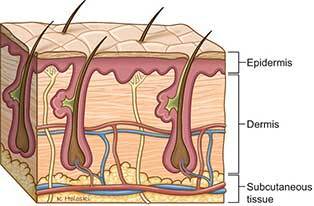 Everybody’s skin is made up of three layers: the outer protective epidermis, the inner dermis and a deeper part (not technically part of the skin) called the subcutaneous layer. When we’re young, the different layers work together to allow the skin to stretch, remain supple and retain moisture. The inner dermis has an elastic quality because of collagen and lots of fibers called elastin, which keep the skin looking and feeling young. Because, over time, the outer layer is exposed to ultra-violet light – main cause of skin damage – and attacked by chemicals (such as those in cigarette smoke), the inner layer gets saturated with poisons that ravage the collagen building blocks and they begin to disappear. This leaves our skin less elastic and more prone to wrinkles. – Sunshine and Ultraviolet light – frequent or excessive exposure to ultraviolet light results in premature skin wrinkling and increased pigmentation (liverspots). Sources include sunlight and sunbeds. – Cigarette smoke – delays the repair mechanism of skin and is one of the main environmental factors that increase premature wrinkling of the skin. Those of us that smoke over the age of 40 could be more susceptible to wrinkles around the mouth because of the strain pursing lips has on the soft tissue in our face. A study in the journal of the American Society of Plastic Surgeons found that the face can be evaluated using dynamic strain analysis. Results showed that the areas of greatest strain occurred to the mid and lower face, with subjects over the age of 40 showing a significant increase of strain when pursing their lips compared to their younger counterparts (58.4% vs 32.9%). – Line and wrinkle injections – Suitable for combating both fine lines and deep wrinkles, wrinkle relaxing injections temporarily relax the facial muscles (for approx 3 – 6 months), prevent further lines and soften existing lines, creating a smoother more youthful appearance. – Facial peels – A facial peel is a specialised medical lotion that intensively exfoliates the skin by removing the outer surface to reveal fresher layers underneath, leaving you with a youthful glow. Our facial peels use natural fruit acids with high levels of active ingredients and antioxidants that leave your skin nourished, refreshed and looking healthier with less fine lines. If you are looking to reduce the appearance of your lines and wrinkles, you may want to consider some of our anti-aging treatments. Contact us to find our more and call us on to 01708 225555.